The Boy Scouts do it. Oh yes they do -- don't you dare try to deny it as this "activity" is one of several indelible memories I still carry with me from my indentured years serving as one of America's Brown Shirts. Apparently, the Duke Lacrosse team does it as well -- one silver spoonful at a time. And then there's Hollywood -- where it is done bigger, better, far more often and without the need of a campfire or a crack-laden whore. What's more, Hollywood folks do it publicly as adults -- it's pretty damn shameful, even by Needtovent.com standards. I'm talking, of course, about the time honored tradition of "The Circle Jerk." The most recent in a long line of American Film Institute "Specials" is just the latest "Circle Jerk" to air on national television. 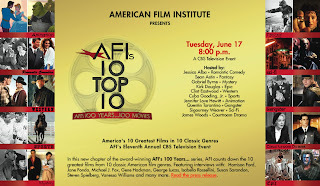 AFI's 10 Top 10 is perhaps the most pathetic in a series of shows by Executive Producers Frederick S. Pierce and Dann Netter and Directed by Gary Smith -- the Tri-Lateral Commissioners of Petty Self-Aggrandizement. Unfortunately, these AFI "Top Ten" and "Top 100" broadcasts have been a yearly staple of insider hype and hoopla since 1998. The 2008 edition is the eleventh in the series, and it, too, is more pretentious than a Phil Jackson press conference. 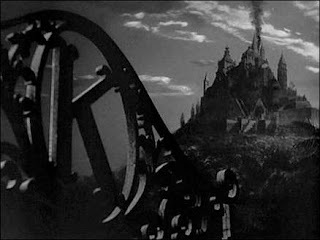 Ten genres were selected, comprising Animation, Fantasy, Gangster, Science Fiction, Westerns, Sports, Mystery, Romantic Comedy, Courtroom Drama and Epic. Seems funny that War films were somehow overlooked, same with Action/Adventure, Horror, Musicals, Film Noir, and, especially shortsighted and grievous, the total lack of any films outside of the established American studio system -- although I admit I'm a bit confused by the inclusion of A CLOCKWORK ORANGE which was far more of a U.K. production than a U.S. one. Consider this: Just one year ago the AFI announced the "The Greatest Movies Of All Time" during it's 10th Anniversary Program. Number 1 on this list was CITIZEN KANE. Number 2 was CASABLANCA, followed by SUNSET BOULEVARD at Number 3. Guess what -- none of these three appeared in this year's AFI's 10 Top 10. None. How can that be? Three seemingly endless hours and CITIZEN KANE, last year's "Greatest Movie Of All Time," is not even mentioned? Also missing were #20 ONE FLEW OVER THE CUCKOO'S NEST, #26 DR. STRANGELOVE, #29 MR. SMITH GOES TO WASHINGTON and #30 THE TREASURE OF THE SIERRA MADRE. To quote Vizzini from THE PRINCESS BRIDE: Inconceivable! Clearly nothing more than a "good ol' boy" network of epic proportions, the AFI is the only cinematic organization I can think of that is more shallow than a Kosovo grave.